A device for manual application packaging tape. Designed for belt width 48 ÷ 50 mm and a maximum length of 132m. The dispenser has a cutting blade and a cap press, allowing for convenient application, and an ergonomic handle with adjustable brake roll. 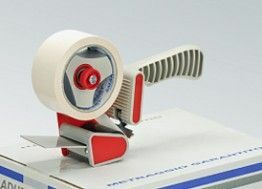 Prevents breaking the tape and wrapping it takes twice as fast.